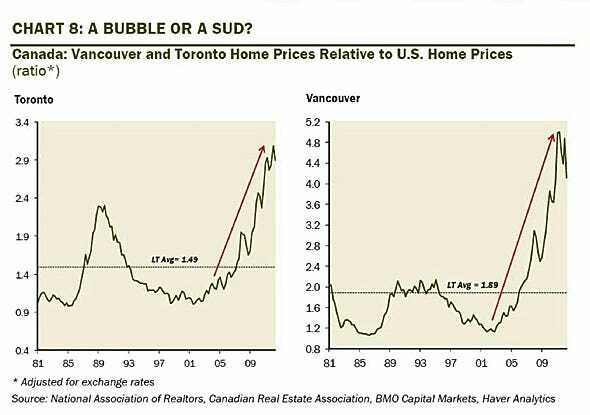 For some time, there has been talk of a growing housing bubble in Canada. Macdonald writes that Shiller and other economists are most worried about household debt, which has ballooned from 75% of household income in 1990, to 150% today. While these debt levels are said to be about the same level of U.S. household debt around the time of its bubble, Shiller does clarify that if the Canadian housing bubble were to burst, Canada’s experience would be quite different from America’s. This is in part because Canadian banks aren’t neck-deep in a subprime lending debacle, and because the mortgages are insured by the government via the Canadian Mortgage Housing Corp.
Rosenberg doesn’t think Canadian home prices are sustainable. The IMF has also warned that Canadian home prices are due for a correction. The latest report by the Canadian Real Estate Association reported that average home prices were up 4% in August, sales were down 5.8%. Meanwhile, the country’sunemployment rate stood at 7.3%. “Canadians seem to think that stricter government regulation in Canada protects them. But they are in some ways more vulnerable than Americans. Americans at least have the option of lifetime payment stability. The gold standard here is the 25- or 30-year fixed mortgage. The interest rate can be locked in for the life of the loan.